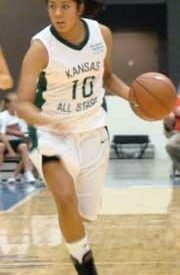 Southwestern Heights legendary head girls basketball coach Barry Mellen who coached the Lady Mustangs to the 3A State Title back in March coached the Kansas All-Stars Saturday to an 81-73 victory over the Nebraska All-Stars. Nebraska got off to a quick start leading 13-4 to begin the game. Kansas rallied back though and led 35-31 at halftime. They never trailed again. The game was a college type format as it was split into two twenty minute halves. Derbyź? ?s Joanna McFarland was the MVP of the game as she scored 18 points. Southwestern Heights’ Vivian Olvera scored three points in the win. Elkhart’s Alecia Smith also participated in the contest. Money raised from ticket sales will be donated to The V Foundation for Cancer Research. Liberal’s Hannah Rotolo will join Olvera and coach Mellen in the KBCA All-Star game that will take place in August.